Our round up of gadgets to enable really close photographs of your subject. Close up photography can be expensive if you buy a true macro lens. But there are less expensive ways of going in close. You can add a whole host of accessories to get you right in to the action. These include wonderful gizmos with names that sound more like sexual contraptions than photographic tools, such as extension tubes, bellows, reversing adaptors and coupling rings. I checked out these low cost alternatives using the good old postage stamp as my static subject and a trusty manual Nikon F3. Each close-up gadget was attached to the camera and, to ensure consistency, the lens was set to infinity in each shot. It is possible, in some cases, to get a larger magnification by focusing at a closer setting. The camera was tripod mounted and the distance from the subject to the front of the lens was measured to give a useful reference for photographers shooting timid insects. The results are shown as full 35mm frames so you can compare the size of image from each product as it would appear. Don't forget if you use print film this is roughly how the subject would look with the varying amount of black background. Versions with a lot of black background could fool the camera's meter. If your camera has a matrix, partial or spot meter you should be okay, but if it is a centre-weighted variety you may get overexposure. Do some test shots first and if the subject appears too light use exposure compensation to close the camera lens down by half to one stop. Correctly exposed negatives may also fool the automatic processing lab exposure system, resulting in photos with a grey background and an overexposed subject. The way round this is ask the lab to use manual settings. If you are not happy and detail is clearly on the negative ask for a reprint. All dedicated close up photographers either own or lust after a pukka macro lens. I bought Nikon's 55mm f/2.8 Micro Nikkor around 10 years ago for just under £200 second hand. It's over £500 to buy new now, but it has the advantage of offering a near perfect performance and gains the close-up ability just by rotating the lens barrel. With most of the other options you have to attach the accessory to do close ups and remove it to go back to distant photography. All fiddly stuff! This Micro Nikkor, like most true macro lenses, is designed to work at its optimum for close-ups. It delivers a 1:2 half life-size ratio - or 1:1 with optional PK-13 tube, some manufacturers provide lenses with true 1:1 ratio without requiring an optional converter. Many of the less expensive products featured here go in much closer, offering greater subject magnification, but few do it as well as the Nikon which produced a razor sharp image. A reversing ring, as the name implies, reverses the lens on the camera body. You need to buy one that matches your body mount with the lens filter thread. All auto coupling is lost so program exposure and shutter-priority modes are not possible, but most cameras will work okay in aperture-priority or manual mode using stop down metering. Canon manual focus cameras need a small adaptor placed on the rear of the lens to lock the aperture down, while screw thread lenses need the aperture coupling pin holding down if there is no manual switch. Canon EF autofocus camera users can not stop the lens down mechanically, but you can buy a Novaflex gadget that does this for you. It costs about 180 though. A reversing ring offers a life-size image that is razor sharp in the centre, but a little softer at the edges compared with a macro lens, but the price (apart from the Novaflex!) is excellent. These are set of three tubes in different lengths that go between the camera and lens to offer a choice of macro ranges. They are available in a variety of lengths £ 12mm, 20mm, 25mm and 36mm, and are sold singly or in sets of three that can be used in any combination to give six options. Their only real drawback is that there is a loss of light in the tubes - this adjustment is made automatically by modern cameras with through-the-lens metering, but compensation is required if you are using non TTL flash. 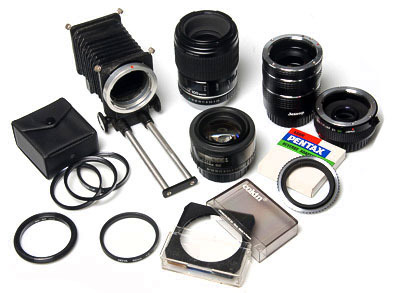 Used in conjunction with a 50mm lens, a 25mm tube gives you half-life-size image, and a full set 1:1 reproduction. We added all three tubes to show the larger than life-size reproduction. As there are no elements inside the tubes, quality is as good as the original lens and the size and versatility is perfect for the nature photographer. Expect to pay: £65 for manual focus and £70+ for AF. This is a small dioptre lens that is often wrongly referred to as a filter. It is available from most filter manufacturers including a version for the Cokin A and P square filter system. They are available in three magnifications: +1, +2 and +3 and, like tubes, can be used in any combination to vary the magnification. Using all three together gives a combined +6 magnification which is on the edge of macro world, but individually they are quite limited for this sort of photographer. They are ideal for larger subjects such as flowers or for anyone wanting to copy old photographs though. The metering and exposure modes in your camera are not affected so close up lenses are simple to use, and if you use the Cokin version the one filter will adapt to a wide variety of lenses with the relevant filter ring. The quality of results is on a par with those from the reversing ring. Close-up lenses individually do not always offer enough magnification, but add them together and it is a different story. We screwed together a +1, +2, +4 to give a +7 magnification. You can expect a loss in quality because light will bounce off all the lens to air surfaces. This appears as slight overall softness with a reduction in contrast. Even so, the quality is still acceptable for most of us and, unless you're intending making big enlargements, it's a good option to consider. This option is the extreme of the close-up lens, offering a powerful +10 magnification. It is simple to use and gives no loss of light or problems with camera metering using auto exposure modes. The image, however, appears no sharper than the combined close-up lenses, so if your subjects vary in size go for the more versatile close up lens set. This seven-element 2x converter has the added benefit of a macro mode which extends out to offer a 1:1 life-size ratio. You lose two stops of light, but the metering coupling is maintained so your camera will take care of the exposure, even in auto mode. The converter, made by Teleplus, is available in most manual focus lens mounts including Canon, Nikon, Olympus, Pentax, Minolta and Yashica and is a very versatile option. The results produced are the closest you will obtain to having a true macro lens. Use it with a telephoto lens and you have a powerful magnifier from close up and afar. Bellows are the most flexible and versatile of all the ultra close up accessories, but they are also the most bulky, cumbersome and fiddly to use. They consist of a rack that attaches to the tripod with a set of rubber or cloth bellows mounted on front and back frames. The frames have a lens mount on one end and a camera mount on the other. To increase magnification you extend the bellows. This will either adjust by unlocking the rail and manually sliding it to the necessary extension or by a rack and pinion method. The latter is the more precise type. Both usually have a fine focus control to ensure the sharpest results. When the bellows are extended you really need a TTL meter or you will have to manually compensate for the loss of light reaching the film. The further you extend the lens from the film the more light lost. Some of the more expensive models have an additional focus rail that lets you swiftly move the whole camera/bellows position closer to the subject so you do not have to continually adjust the tripod position. This adaptor requires two lenses to function - one is attached, as normal, on the camera, the other is reversed on front of the camera lens. The ring screws into the filter thread of both lenses. This method offers the closest focus of them all, but care is needed when choosing lens and aperture combinations. The best results are obtained when a smaller focal length lens such as a 50mm is reversed on the front of a longer one, say 105mm. You need to shoot with the reversed lens at the maximum aperture because the image goes black at the edges as you stop down. Results are sharp at the centre, but there is considerable fall off in quality towards the edges of the photo.